In case you can’t be bothered to read the whole blog post, here’s a short summary of my opinion of this definition. 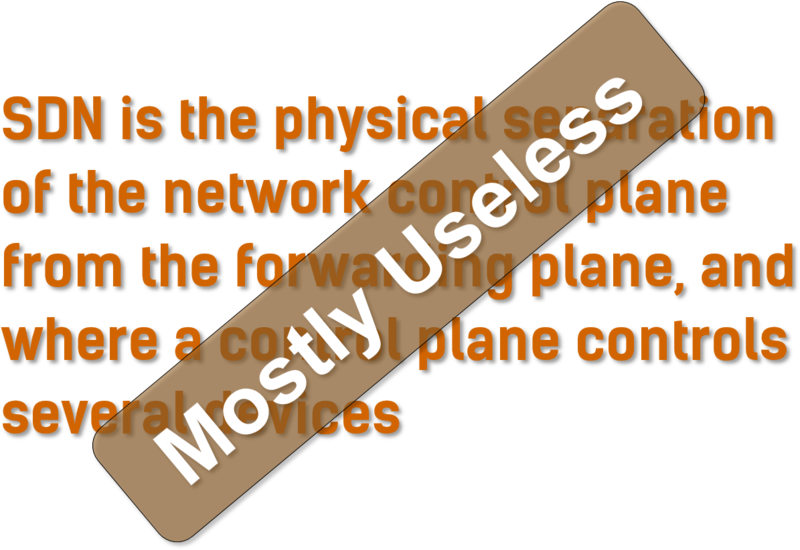 It’s a slide from my Introduction to SDN presentation, which is part of the SDN workshop as well as numerous SDN presentations I had in the last years. While the ONF web site still features their marketing definition of SDN, I wanted to dig deeper while writing my Centralized Control != Centralized Control Plane blog post (read also the follow-up post), and focused on SDN Architecture 1.0 document (published in June 2014). The SDN Architecture document was obviously written by people with real-life networking experience (as opposed to academics and marketers) and contains a large number of really interesting statements (see also RFC 1925, section 2.4). If you’re even remotely interested in SDN, you (RFC 2119) SHOULD take the time to read it and think about what it’s trying to say and what the implications are. Let me quote a few of those statements (obviously out of context – but then I told you to read the whole document, right?). Please note that I’m not bashing the SDN Architecture document. Its authors did a marvelous job; I’m just pointing out what happens with a seemingly simple concept once someone tries to implement it and gains some operational experience. The concept of a data plane in the context of the SDN architecture includes traffic forwarding and processing functions. A data plane may include the necessary minimum subset of control and management functions. The data plane implements forwarding decisions made in the controller plane. In principle, it does not make autonomous forwarding decisions. However, the controller plane may configure the data plane to respond autonomously to events such as network failures or to support functions delivered by, for example, LLDP, STP, BFD, or ICMP. Did you notice that they talk about controller plane and not control plane? It’s also worth noting that the current version of OpenFlow doesn’t provide any functionality in this direction. For more details, watch my OpenFlow Deep Dive webinar. Controller components are free to execute on arbitrary compute platforms, including compute resources local to a physical NE [network element]. Controller components can reside on network elements. Takeaway: Based on this broad definition, almost anything with a central control element (aka NMS or orchestration system) can be called SDN (so SDN is really becoming as meaningful as cloud). People who have been building working and sustainable networks for long time know what it takes to do it properly. One can play politics and marketing for some time but when it comes to real deplyments, BS gets exposed rather quickly! Very much appreciated, Ivan. We in the ONF architecture working group have been trying to get this more nuanced message out for quite a while now. When the NMS failed, they called it SDN. When collocation and off-premises hosting failed, they called it Cloud. IPv6 did not see the light due to several reasons. You cannot kill the TCP/IP technology overnight. Managing it will remain the same, call it SDN, NMS or other. Does SDN bring "more programmability"? More code? Who needs that? IF so, how does it simplify? If not, what capabilities and visibility are missing in SDN? You blog opened my eyes! In my opinion all the new names, terms, products from vendors and OPEN things are a bit fake and only introduce confusion. Nevertheless I clearly see potential and usage for SDN, VNF and Cloud if deployed in a smart way.